Detectives investigating a stabbing in Rotherham are trying to trace two potential witnesses. A woman was walking her dog along Mineral Lane pathway - near to the former pit site in Thurcroft - when a man grabbed her from behind. She had just reached the bridge that crosses over Steadfolds Lane and had turned round to walk back along the path when the man grabbed her and stabbed her twice in her back. Detectives said the woman managed to kick out at her attacker and pulled him to the ground, before he fled. It is believed a jogger and cyclist in the area at the time may have seen the attacker. He struck at around 11am on Monday, April 20. The offender was 5ft 11ins tall, in his late 20s or early 30s, slim and scruffy. He was olive-skinned with short, dark brown hair and stubble. He was wearing a light blue football shirt with a white band or motif across the chest, with grey scruffy jogging pants, white socks and black trainers. 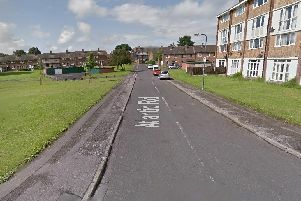 A South Yorkshire Police spokeswoman said: “The man is alleged to have assaulted the woman, stabbing her twice in the back. “She managed to kick out at the suspect, pulling him to the ground. He is then believed to have run away in the direction of the bridge. The woman was taken to hospital to be treated for her injuries.